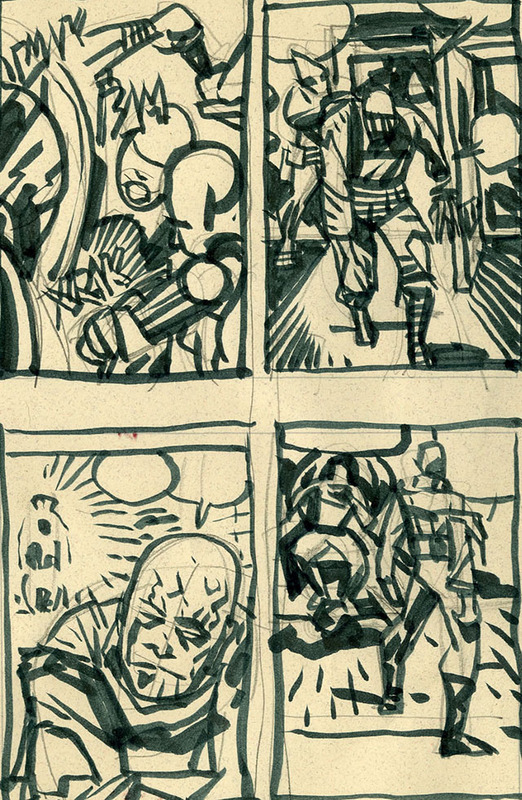 Why Copy Jack Kirby’s Work? 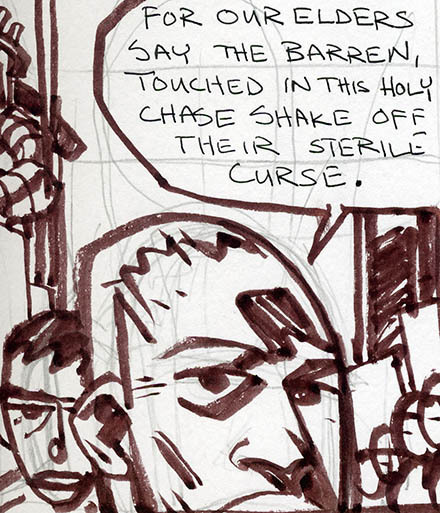 I realized in starting to draw Julius Caesar, based on Jack Kirby’s designs, I was in trouble. 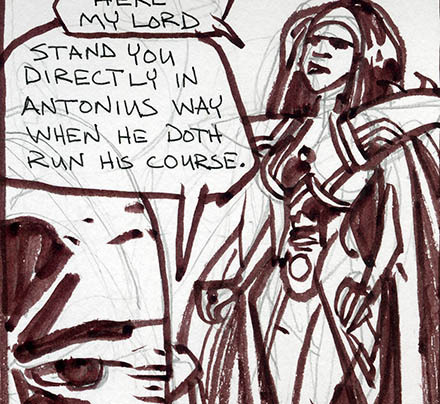 Shakespeare didn’t work as comics, Kirby’s work based in action was a bad way to approach Shakespeare, I was lost. 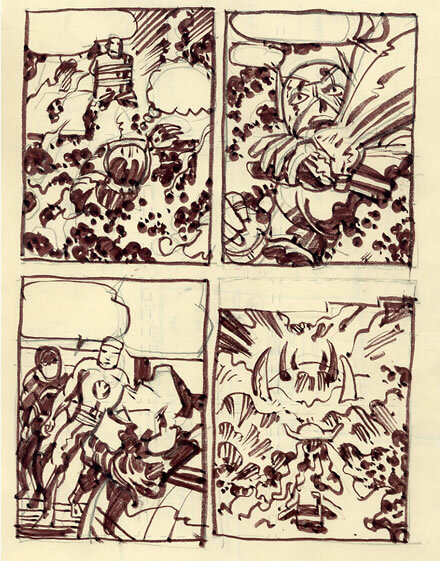 To study Kirby’s work, I started copying a page a day. 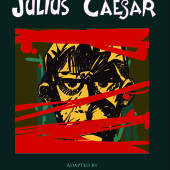 To study Shakespeare, I just made the comic. Huge walls of greatness loomed in front of me. There was nothing to do but draw. 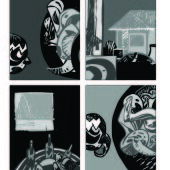 Jack had no problem doing centered images , putting his figures right in the middle of the panel. Panel 1 in split ith the foreground with the back of Orion in flames, at the top, dad is just wrapped in the pillar. It’s static except for the flow of flames around them that turn it into a panel flowing and implying a huge space between them. Lightray pulls Orion out of the flames, shouldn’t this be more dramatic for such a huge close up they are just going inside. Inside to see the dead kid turned back to a human being. 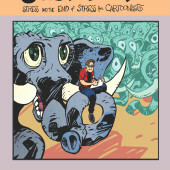 Jack gives us a sad face of the heroic kid at the end of it all, his face composed and calm. By once again giving us a large shape the figures are just walking in, just standing there doing nothing until we get the final panel. And the fourth panel gives us the surging beast and another centered image pulling it out into a pure kinetic flow. The drawing, the details and the rendering don’t matter it is panel flow the choice to make it medium, close closer then long which give a flow to the gridded off page. Jack stacked heads and made space with his heads far deeper then any reality could have had.